This is the latest indoor system we are working on. It is a small tabletop aquaponics system using a 350mm tall by 220mm diameter cylindrical glass container (14.5 liters/3.8 gallons), a modified 6 liter water bottle planter with pumice (volcanic stones), a small aquarium pump, and a 3D printed support and cover. Since there is not enough light indoors to grow anything of significance, a 30W LED floodlight is used above the first unit (left image, right side), and a 50W LED floodlight above the second (left image, left side). All of this is placed within a modular metal shelf designed for supporting a lot of weight. The containers host platy fish, freshwater shrimp, and common aquarium snails, all of which have been successfully reproducing, creating a sustainable micro-ecosystem. The IoT environmental sensors have been moved from the grow box to the shelf. 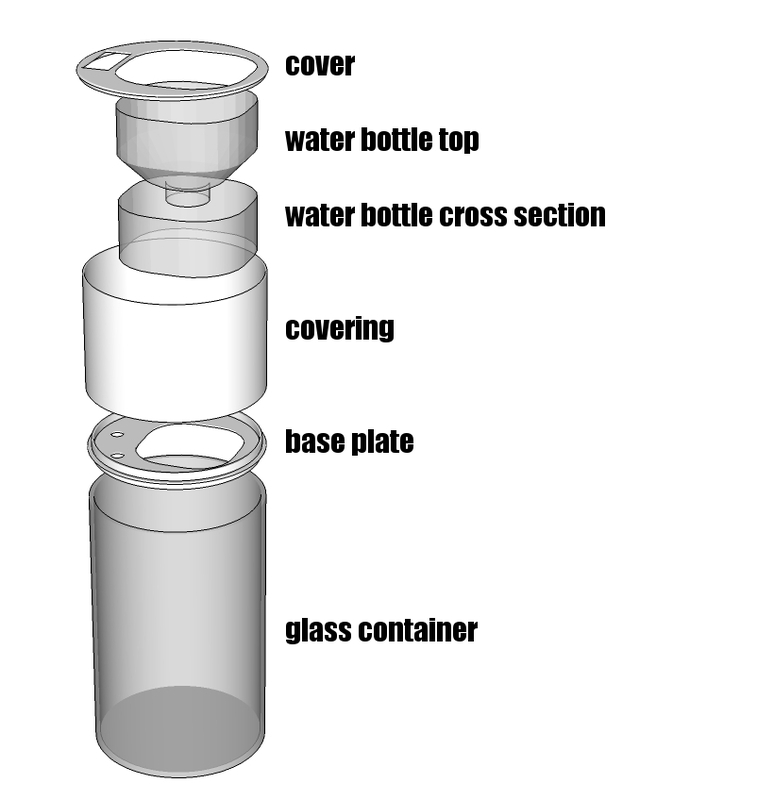 The files for this project, including the SketchUp file, are already up on Thingiverse here. 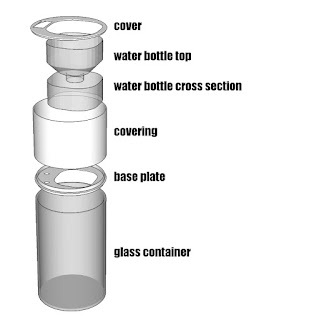 It's probably unlikely you will find the exact glass container we are using, so the SketchUp file will help you see how we designed our project and give you a starting point for customizing your own system. Even between the two containers we used, despite being almost identical, the diameter had to be adjusted by between 2-5mm. Something similar is also possible for small rectangular tanks. Since this is a larger project, the casing and platform are pretty big and need to be printed out in pieces and friction welded together. For an overview of this process, please see this post (with video) from Hackaday. Significant warping occurs when printing the side halves of the case. In order to friction weld them together, a length of filament must be inserted into the gap and then welded over. The process is explained in more detail here. 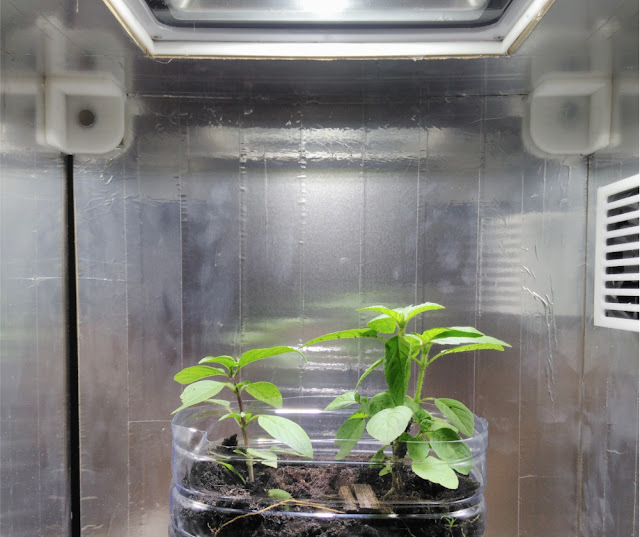 A grow box is a basic means of creating an indoor garden using artificial lighting and a varying degree of automation. It is useful if you lack rooftop, balcony, or other outdoor space for growing. 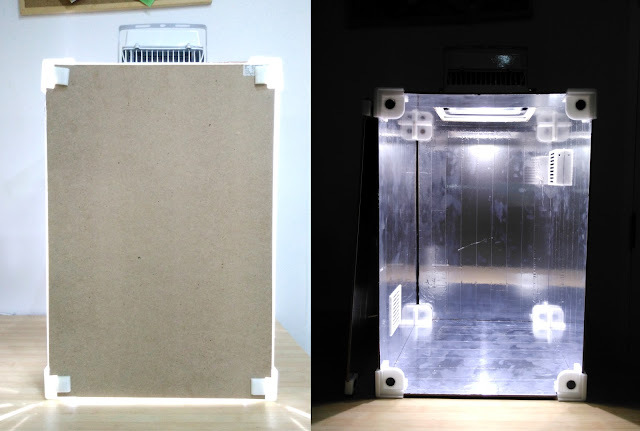 The box itself provides a means of suspending the lighting and enclosing it to maximize reflection back onto the plants. The box also serves as a platform to add in automation for irrigation, ventilation, monitoring, and more. This prototype was constructed from 600x400mm MDF boards, 3D printed joints, aluminum foil tape, and magnets to create a front magnetic panel for accessing the interior. It uses a 30W LED floodlight for illumination. It has been used to successfully grow herbs before, but it is still unknown whether or not it can successfully be used with fruiting plants like chili peppers or tomatoes. Using the IoT weather station from a previous project, we were able to monitor and record the internal conditions of the box. The graphs displayed the information as it was updated in real time (Bangkok time). This monitoring system is now being used for the indoor aquaponics system. So far, only two types of basil were grown inside it using soil as a grow medium just to see if anything at all will grow inside. 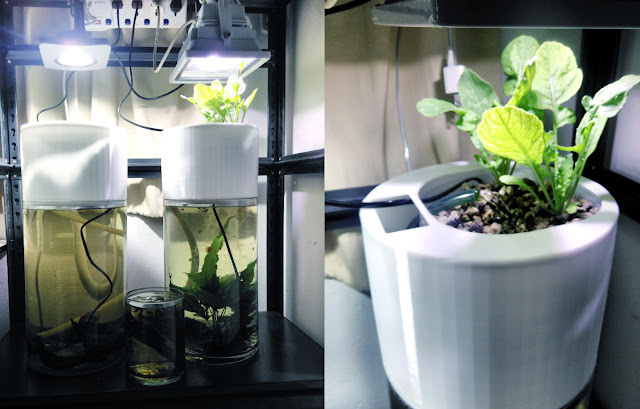 An aquaponics system developed for this project ended up turning into the project featured above. This project was an attempt to replicate MIT's Personal Food Computer using materials readily available here in Bangkok at hardware, electronics, and stationary stores. Careful, patient use of a utility knife can be used to cut the MDF board. Hot glue is used to join everything together.